(a) When the tire pressure warning light comes on, immediately check each tire pressure and adjust it to the specified value. The tire pressure warning light will come on after blinking for 1 minute, if there is a malfunction. In this case, refer to the following troubleshooting procedure to repair the malfunction. 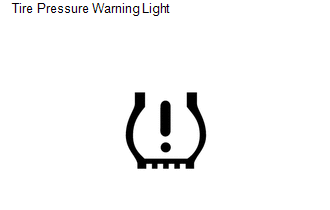 (b) When the tire pressure warning light comes on after blinking for 1 minute, there is a malfunction in the system. Check for DTCs. (c) It is necessary to register the transmitter IDs in the tire pressure warning ECU after replacing a tire pressure warning valve and transmitter and/or the tire pressure warning ECU (See page ). (1) Using the Data List, read the transmitter IDs registered in the ECU and make a note of them before removing the tire pressure warning ECU. (2) Register the transmitter IDs after installing a new tire pressure warning ECU. (1) Make a note of the 7-digit number (transmitter ID) written on the new tire pressure warning valve and transmitter when replacing the old one. Register the transmitter IDs in the tire pressure warning ECU after replacing the tire pressure warning valve and transmitter and installing the tire and wheel onto the vehicle. The transmitter ID is written on the tire pressure warning valve and transmitter. It will not be possible to read the transmitter ID after installing the tire onto the wheel. Therefore, make a note of the transmitter ID before installing the tire. After a tire pressure warning valve and transmitter is replaced, it is necessary to register the transmitter IDs. It is not necessary to register the transmitter IDs after a tire rotation is performed. Drop the tire pressure warning valve and transmitter into the tire before disengaging the tire bead from the wheel. Be careful not to damage the tire pressure warning valve and transmitter because of interference between the sensor and tire bead. In winter, tire pressure may decrease due to low ambient temperatures (the tire pressure decreases by approximately 10 kPa (0.1 kgf/cm2, 1.5 psi) for every 10°C (50°F) drop in the ambient temperature). Therefore, the tire pressure warning system is more likely to indicate a warning if the tire pressures are not adjusted appropriately. If the daily temperature variation is large, add enough pressure to the tires so that the tire pressures are suitable under cold conditions. As a result, unnecessary tire pressure warning operation should decrease. (a) When tires and wheels are replaced, always ensure that each transmitter ID is correctly registered. (b) Before removing the tires from the wheels or reinstalling the tires to the wheels, be sure to follow the correct procedures for removal and reinstallation of the tire pressure warning valve and transmitters. Failure to do so may cause the tire pressure warning valve and transmitters to break (See page ). (a) When a system malfunction occurs in the tire pressure warning system, the tire pressure warning light comes on after blinking for 1 minute to inform the driver of the system failure. (b) The result of this diagnosis is stored in the tire pressure warning ECU. (a) After repairs confirm that the actual tire pressures are displayed in the Data List (See page ). (a) To prevent damage to the tire pressure warning valve and transmitter, make sure that the tire pressure warning valve and transmitter does not interfere with the tire bead when installing a tire. (b) After removal and installation of a tire pressure warning valve and transmitter, remove the valve core to rapidly release the air from the tire and check that the warning light comes on. If the warning light does not come on, the system may be malfunctioning. (c) If air leaks, tighten the nut to a torque of 4.0 N*m (41 kgf*cm, 35 in. *lbf) and push the valve core 2 or 3 times to remove any dirt attached to the valve core. If air continues to leak, replace the grommet, washer, and nut. (d) When installing the tire pressure warning valve and transmitter, make sure the rim, grommet, washer, and nut are clean. Use a manufacturer-specified valve cap. (e) When putting air into the tire, first install the valve core straight into the stem of the tire pressure warning valve and transmitter. (a) To prevent damage to the tire pressure warning valve and transmitter, drop the tire pressure warning valve and transmitter into the tire whenever removing the tire from the wheel. Always use a new grommet, washer and nut when installing a tire pressure warning valve and transmitter. (b) If tires and wheels are replaced, register the transmitter IDs (See page ). (a) When a second set of wheels and tires with tire pressure warning valve and transmitters (such as a set of winter wheels) is prepared, it is necessary to make a note of the transmitter IDs. These numbers need to be recorded and kept in a safe location. (b) When the second set of wheels and tires is to be installed, it is necessary to check the Data List using the Techstream and record the transmitter IDs of the existing set of wheels and tires before removal. These numbers need to be recorded and kept in a safe location. The numbers will be used when the original set of tires is reinstalled at a later date. The existing transmitter IDs must be recorded before registration of the second set of transmitter IDs. If the existing transmitter IDs are not recorded, it will be necessary to remove the tires to read the transmitter IDs off of the tire pressure warning valve and transmitters when this set of tires and wheels is re-installed at a later date.